There was a famous tightrope Walker from France who lived in the 19th century whose name was Charles Blondin. He was famous for his tightrope act 160 feet above Niagara Falls on a one-thousand-foot-long rope. And he did this show, not just once, but on several occasions from about 1859-1861, each time walking across Niagara Falls on a one-thousand-foot-long rope. Maybe it would have looked something like this… This is a video of another tightrope walker, named Nic Wallenda, who walked across Niagara Falls in 2012. That looks a little scary, right? But I want to go back to Charles Blondin. In 1860, he did a really cool trick for a royal party from Britain. He crossed the tight rope first, and then he came back – only this time he was on stilts – and then he came back again, carrying a stove, and he stopped in the middle and cooked an omelet and ate it. And then, Blondin went across with a wheelbarrow. And finally, when he was done pushing that wheelbarrow across, as the story is told, he approached the Royal party and he asked the Duke of Newcastle, saying, “do you believe that I could take a man across this tightrope in a wheelbarrow?” And the Duke looked at him and he said, “Well, yes I do.” And Blondin looked at him and said, “Well, then hop in!” And the Duke said, “No thank you.” He wouldn’t get into the wheelbarrow and trust Blondin with his life. 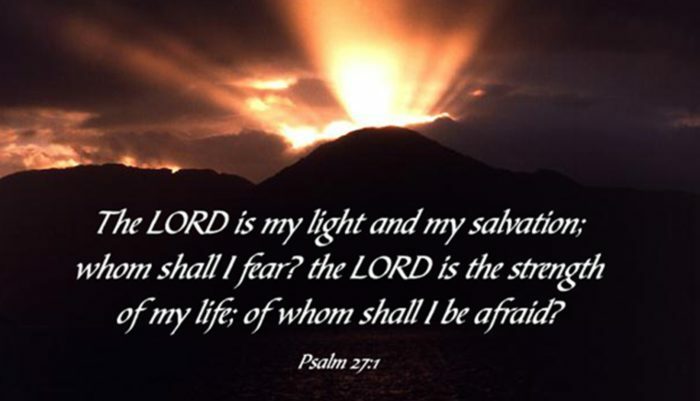 Today, we’re looking at Psalm 27. This psalm, and question, came up a couple of years ago, when we had a speaker at our annual Breakfast with the Bishop, by the name of Rolf Jacobson – he is a professor at Luther Seminary in St. Paul. If you happened to be there at that breakfast, you may remember his story, how at the age of 15 years old, he was diagnosed with cancer and lost both of his legs to cancer. Both legs had to be amputated way up to his hips. And he said, that throughout the cancer diagnosis and the surgery and the treatments, he never felt fear, until one day he realized that he would have to live the rest of his life without legs, which meant he would need to go to high school without legs, he would need to navigate college without legs – dating, marriage family, all those things. And that struck fear in his heart. And so, he said, it was the Psalms that got him through all those times of fear. Imagine, repeating that over and over as a fifteen-year-old going through the unimaginable. And Rolf told us, at the Breakfast with the Bishop, that this is what got him through – memorizing verses from the Psalms – repeating them over and over – that gave him strength. And Rolf said, that whenever he shares that story, he meets others who have found strength in the Psalms – strength to get them through a difficult time. As I was looking through the Psalms of trust – there are quite a few in the book of Psalms in the Bible – I noticed that there’s a recurring theme, that the opposite of what people experience as trust is something we call fear. Fear says, “Run, hide, quit, give up.” Trust is the opposite of that. And another Psalm of trust is Psalm 46. See if you can listen for the word ‘fear’ in this one: “God is my refuge and strength, a very present help in times of trouble. Therefore, we will not fear, though the earth should change, though the mountains shake in the heart of the sea; though it’s waters roar and foam, though the mountains tremble with its tumult.” That Psalm says, ‘the world may be falling apart, but we keep following God, doing the things he has called us to do.’ That’s what it means to trust God. These psalms of trust are written by people who have been around the block a few times, who have experienced difficult times. They’ve known troubles and struggles, and yet they have experienced that God is faithful to bring them through those times. I remember taking driver’s training as a 15-year-old, working up to getting my driver’s license. First was the classroom instruction. And one thing we did was to watch those videos of crash dummies, and we saw what happened in an accident when someone was not wearing a seatbelt. And when it came time to get behind the wheel of a car for the first time, with our driving instructor, we were reminded again and again to buckle our seatbelts, so in case we had to stop fast, or if we were in an accident, that seatbelt would hold us tight. The Psalms of Trust proclaim that we have a God who, ‘in the midst’ of our fears, ‘in the midst’ of life that is uncertain – holds us in tight. This is a kind of trust that believes – even if our life is not going well, even if we are facing troubles and struggles – that we God can be trusted to get us through it. Today, we have a group being sent on a mission trip. We will go to Minneapolis to serve, to learn, to help, to do for others whatever our hands find to do. We go on this trip, with hearts wide open, to get a deeper understanding of the needs of others, and to help, however we can. We’re on this trip to be a blessing to others. And so, we’ll be in new places, having new experiences, meeting new people. In Jesus, we have a God who can be trusted.